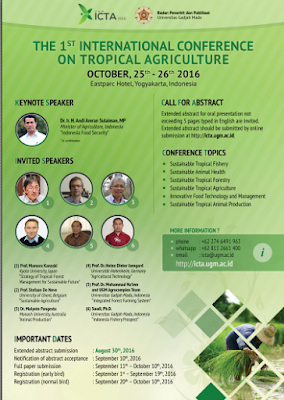 Yogyakarta, Bekanews.com - You are cordially invited to submit your paper at the 1st UGM International Conference on Tropical Agriculture (ICTA) 2016. This international conference will be held on October 25-26, 2016 at Eastparc Hotel, Yogyakarta, Indonesia. This conference will provide the platform for the researchers, scientists, professionals, policy makers, managers and environmentalist to share and exchange ideas on the wide scope of Sustainable Tropical Agriculture. ICTA is a peer-reviewed conference. Selected papers at the conference will be published either in the International journals or in the UGM Scientific Conference Proceeding. Kindly please find the detail information of two days conference on the website http://icta.ugm.ac.id/. Any inquires relating tho this conference, please feel free to contact us on e-mail to icta@ugm.ac.id. We are sincerely hoping that you can help us circulate this call for papers to your colleagues and/or students. We are looking forward to meeting you in Yogyakarta, Indonesia. 0 Response to "ICTA 2016 UGM"